At T-Scan, we leave no stone unturned in our quest to help you do your job better. Our account specialists are the most knowledgeable in their field and available to you at a moment’s notice — which eases the load on your law firm and allows you to get more done in less time. This is a place where you can find answers to common questions about our online system, but if you don't find an answer here, contact your account specialist. Log into your online.tscan.biz account. Select the Change Password option in your left navigation menu. Enter your current password and the new password you would like, then confirm your new password. 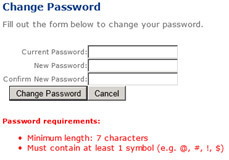 Remember, your password must be a minimum of 7 characters and must include at least one symbol. Click the Change Password box to complete the change. You will be routed back to your home screen once the change is complete. What are status emails and can I turn them off? 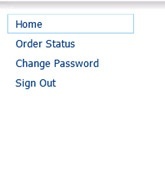 Status emails are reminders that order status can be viewed on your T-Scan website. Order status is updated in real time and can be viewed at any time. As a default, status reminders are sent weekly. The frequency can be changed, or status reminders can be turned off completely by contacting your account specialist directly, emailing info@tscan.biz, or calling us toll free at 800.285.1507. Why am I getting new record notifications and can I change the frequency? New record notifications are sent to you when new records have been uploaded to the document library and are ready for review and download. As a default, these notifications are sent as the records are available. If you would like to receive notifications less frequently or not at all, contact your account specialist directly, email info@tscan.biz, or call us toll free at 800.285.1507. I cannot access your website. Some clients may have issues accessing servers on the tscan.biz domain when attempting to go to online.tscan.biz. If this happens, it probably means you need to set up Conditional Forwarding for the tscan.biz domain. The documentation below will help your IT team fix this issue. If you are still having issues after completing these steps, please contact your account specialist directly, email info@tscan.biz, or call us toll free at 800.285.1507. Step 1: Confirm that improper DNS resolution is the problem. Start > Run... > cmd. This will bring up a command window. 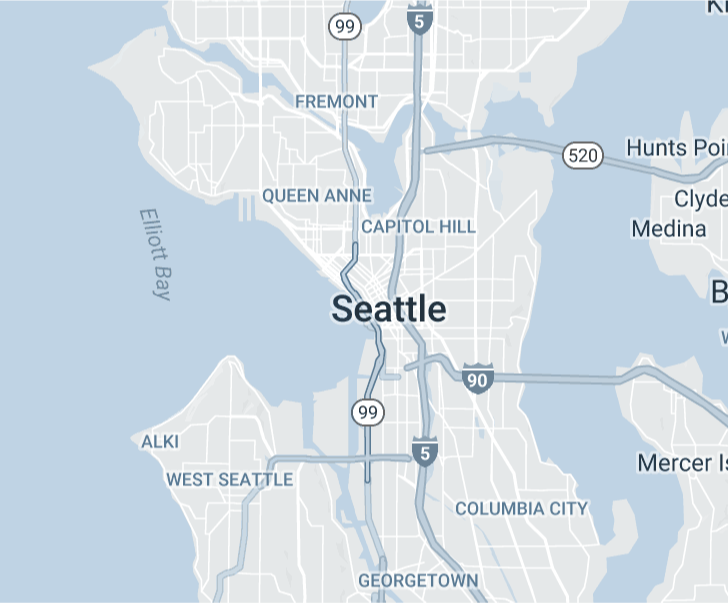 The resulting address should be: 140.239.149.7. If you get any other result, you will need to set up Conditional Forwarding on your organization's internal DNS server. Go to Step 2. If you get this result and are still unable to reach online.tscan.biz, then it’s likely that you’ve got a firewall or other security software blocking the site. Step 2: Apply Conditional Forwarding to your organization’s internal DNS server for the tscan.biz domain. In short, we want any requests for the tscan.biz domain to be resolved by Google’s DNS server, 8.8.8.8, instead of the internal DNS server where the problem lies. Step 3: Clear your computer’s DNS cache, then confirm the site is now resolving correctly. This will clear the list of remembered sites and IP addresses stored in RAM. After completing Step 3, online.tscan.biz should appear properly. If it still doesn’t, then it's likely that a firewall or security software installed on your computer is blocking the site. Automatically Sign Me In is not working. 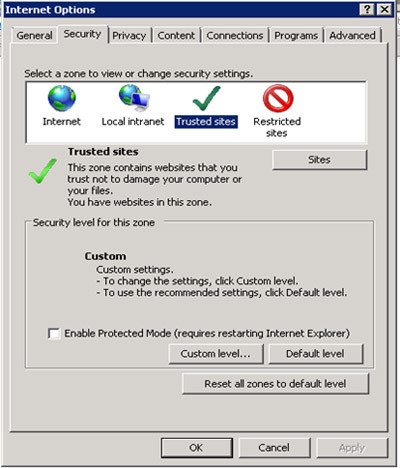 If you are having issues using the Automatically Sign Me In option when logging onto online.tscan.biz, follow the instructions below to modify your local Internet Explorer settings to allow this capability. 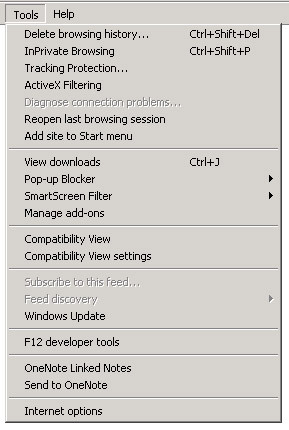 Note that these changes work only for browsing using Internet Explorer. Before signing in, click Tools in the menu. From there, select the Security tab. 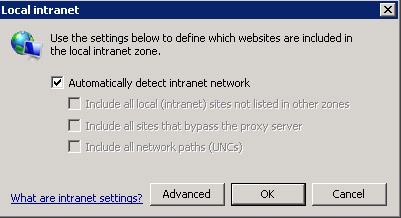 Under the Security tab, select Local intranet. After selecting Local intranet, click Sites. In the dialog box, click Advanced. online.tscan.biz should appear in the Add This Website text box; if not, type it in. Click Add. If the dialogue box shown below pops up, click Yes. This dialogue box may or may not appear. Reopen Internet Explorer and browse to online.tscan.biz. Select Sign me in automatically. Enter your login credentials and sign in as normal. 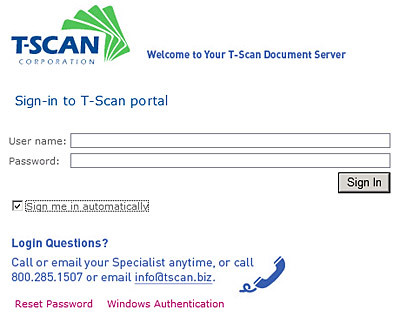 The next time you browse to online.tscan.biz, you should be signed in automatically. I cannot see status on my orders. How can I get status for these orders? If you would like to view the status of a current case but cannot, please contact your account specialist directly, email info@tscan.biz, or call us toll free at 800.285.1507. We will be able to set this up for you. There are several ways to reset your password and gain access to your T-Scan site. 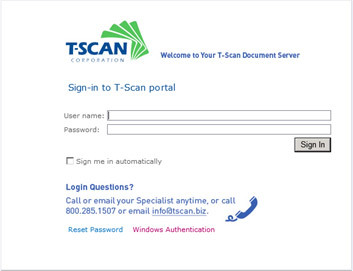 The first, and easiest, way to reset your password is on the login page to online.tscan.biz. Click Reset Password below the login area. When prompted, enter your user name and click Submit. Within 5 to 10 minutes, you will receive a temporary password in your email inbox. Copy the temporary password from the email and enter your email address where prompted and paste in your temporary password. Once you are logged in, click the Change Password link on the left navigation menu. Again, paste your temporary password into the Current Password field. Enter your preferred password into the New Password field and confirm it in the Confirm Password field. 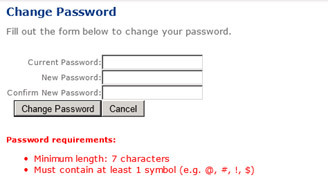 Note: Passwords must be a minimum of 7 characters and must include at least one symbol (e.g., @, #, !, etc.). Click Change Password and you will be directed back to your home page. Your password has successfully been reset. You can also click the Forgot Password link contained in all T-Scan email notifications. This link will jump you directly to Step 3. Follow the above directions from there. If you still have problems resetting your password, please contact your account specialist directly, email info@tscan.biz, or call us toll free at 800.285.1507. My new password is not being accepted. What am I doing wrong? Passwords must be a minimum of 7 characters and must include at least one symbol (e.g., @, #, !, etc.). Example: tristan01$. tristan01 is not an acceptable password because it does not contain a symbol (in this example, $).